Yichen Shi (YS): I am the founder and CEO of Axol Bioscience, the human cell culture specialists. I lead the development of company’s strategies to ensure that we continue to deliver both epic customer support and innovative products that will help our customers advance faster in their research. [AT]: How did Axol come to be founded? 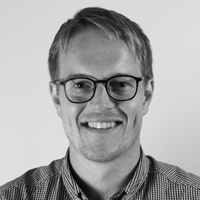 [YS]: I started Axol when I was still finishing my PhD at the University of Cambridge. While I was working on making cerebral cortical neural stem cells (NSCs) from human induced pluripotent stem cells (iPSCs), I developed an efficient method of making high purity NSCs. As the need for better models of human CNS disease was increasing, I saw the opportunity to offer these ready-made neural cells, which would be valuable for researchers who don’t want the burden of generating cells themselves or demand more consistent cell quality. I’m particularly grateful for the early support provided by business angel Dr. Jonathan Milner. His initial funding helped me to kick start Axol in 2013: I was able to rent a hot desk and a bench to produce the very first batches of cells, which I later sold to pharma and academic labs. As our revenue grew, Axol attracted more funding from private investors, VCs and government research funding bodies for product and business development. Our product line has been widely adopted by labs across academia and the biomedical research industry. Thanks to the support from customers and funding providers, Axol has diversified and we are now the one-stop-shop where researchers can choose from a vast range of human cell types and culture reagents. 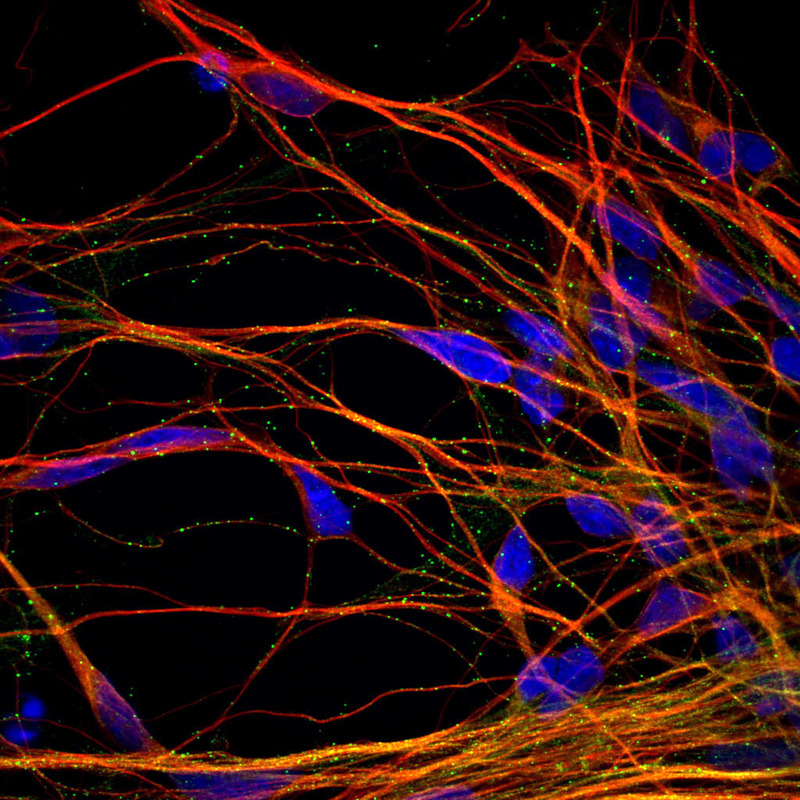 Human iPSC-derived cortical neurons express vGlut1 (green), TUJ1(red) and DAPI (blue). Credit: Axol Bioscience. [AT]: What were the main drivers to start Axol and what challenges did you face to develop a company in the stem cell space? [YS]: The main driver to start Axol was the strong market need of physiologically relevant human cells for developing better human disease models and drug testing platforms across academia and the biomedical research industry. The iPSC technology was advancing rapidly and provided a unique opportunity for making larger amounts and more diverse types of human cells for research purposes. Axol was founded to deliver this innovative stem cell technology to customers. One of the main focuses or challenges for me in developing a young company has been pulling together experts across R&D, production, supply chain, marketing and technical support. By recruiting these in-house experts and harnessing their experience, we have been able to ensure continued strong growth and smooth operations. As a result, Axol has been growing steadily over the last 5 years and has transitioned from a young start up to a professional organisation serving the needs of biomedical research industry. [AT]: What are the challenges you face now in terms of meeting the needs of your customers? [YS]: Every lab is trying to develop something unique or experiment from a different angle. As a human cell culture supplier, we need to ensure we are able to respond to these wide-ranging needs across academia and industry. This boils down to making sure that we can find the right donor, provide the right cell type(s) and are geared up with knowledge and techniques such as electrophysiology and gene editing to help our customers to accomplish their diverse research goals. 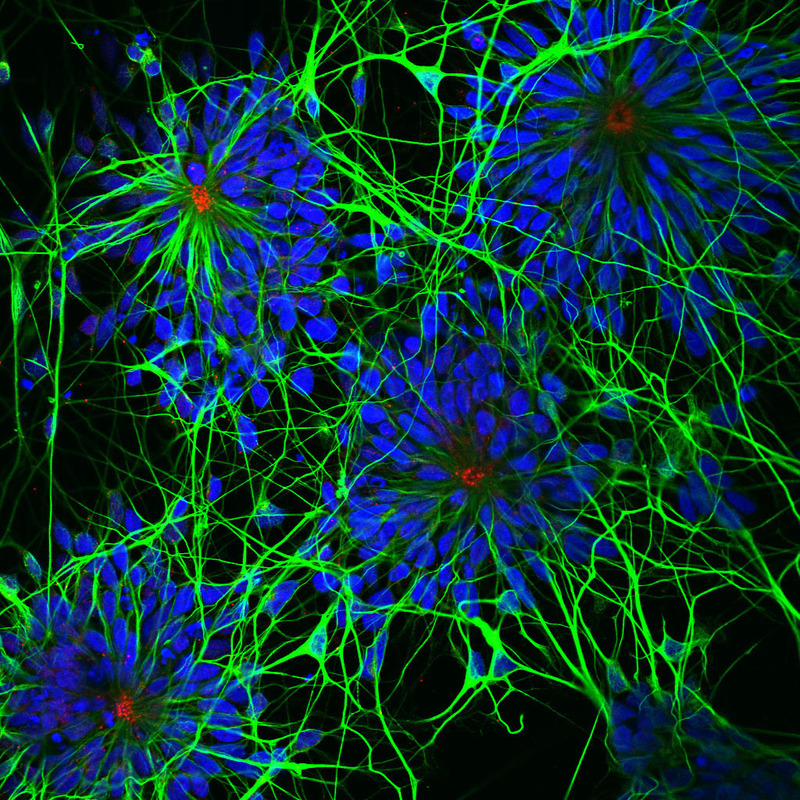 Human iPSC-derived Neural Stem Cells forming a rosette structure. Markers used: acetylated alpha tubulin (green), CEP135 (red) and DAPI (blue). Credit: Axol Bioscience. [AT]: What does the future look like for stem cell research and how are Axol helping researchers achieve their vision? [YS]: More and more research labs are starting to use iPSC technology and iPSC-derived products. The technologies for generating important human cell types from iPSCs and their applications in biomedical research are evolving and advancing rapidly. It is taking less and less time to generate purer populations of target cell types. We are already seeing multiple cell types generated from iPSCs from individual donors being assembled into 3D cell cultures or onto microfluidics chips to create in vitro human models that better reflect human tissue and organ physiology. To support this exciting research landscape, Axol is playing a crucial role in translating novel lab technologies into industry applications. We are not only scaling up production of stem cell-derived cells to industrial quantities, but also making sure that our products are easy to use and have consistent quality and performance, which we know are critical for our customers' research.